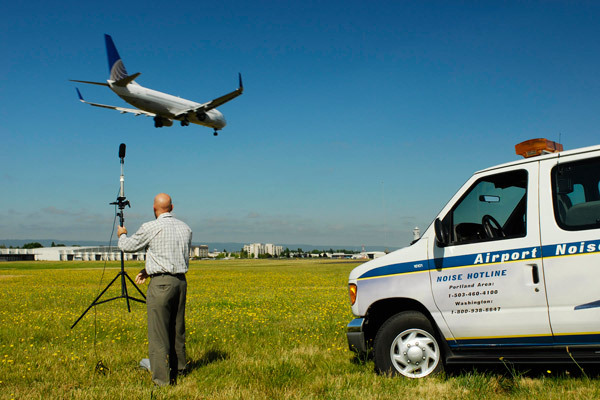 Living near airport has its pluses, but neighbors want to know — can you quiet it down a bit? Planes, trains and automobiles. When you live in the city, it’s pretty much a given that you’re going to hear one or all of those, plus the kid with the oversize sub woofer in his car — sometimes in the middle of the night. And, when you live near an international airport, most people figure a little noise goes along with the convenience of a short trip to catch a flight. But what happens when a little becomes a lot? Many neighbors, judging from conversations in the neighborhood and a flood of responses to a question on Nextdoor.com, expressed concern about the noise generated from small Federal Express “cargo feeders” as the Port of Portland calls them, and the fighter jets operated by the Air National Guard. Others wondered why the cargo planes flew so low. FedEx planes have been observed flying only slightly higher than utility poles, which Pacific Power representative estimates are 150 feet tall. In some cases the planes are so low, the plane’s belly rivets can be clearly seen. To be fair, some residents said they actually like the National Guard jet noise, finding it comforting in these uneasy times. Others figure they moved in knowing full well they’d be near an airport. When the planes or jets roar over, people may pause their conversations, try to comfort their kids and pets, and later straighten the pictures on the wall. CNews sent questions to the city of Portland, FedEx, the Air National Guard and the port. Only the port responded. Kama Simonds, aviation media relations manager, said cargo feeder approaches are designed by the Federal Aviation Administration for safety, and that a Concordia resident living a mile away should see aircraft “at or very near 300 feet.” She said pilot discretion or an order from air traffic control could explain some aircraft flying under 300 feet. As for noise, she said, 24/7 monitoring at Concordia University for arriving small planes averages 73 decibels, which she compared to standing next to a vacuum cleaner or a truck passing outside. Asked why propeller planes were allowed to rev their engines on the tarmac, sometimes in the wee hours of the night, she said, the small cargo planes are required to test engines at full throttle – but are not required to use sound insulating hangars. Steve is a veteran journalist, writer, editor and former Concordia Neighborhood Association board member. He has lived 17 years in the neighborhood. Contact him at CyStev33@yahoo.com. Editor’s note: Visit ConcordiaPDX.org/port-q-a for the full list of questions asked and responses from the port, along with comments from neighbors published on Nextdoor.com.